The Most Valuable Player (MVP) awards given out every year in the National and American Leagues are two of the most coveted individual prizes in sports. Winners are immortalized in baseball’s storied history and talked about years after they’ve retired. When considering the best of all time, MVPs go a long way. The awards make most winner’s almost shoo-ins for the Hall of Fame and in terms of legacies there’s little better a player can do than win even one MVP. The following preview will break down 2018’s favourites for the award and give some interesting options and dark horse candidates for consideration when betting baseball. Last year’s MVP Award winners remain close to the top of the list as their odds of repeat performances are high when browsing the top betting sites. The Houston Astros’ Jose Altuve faces 5/1 odds of retaking the American League MVP crown while last year’s National League honoree, slugger Giancarlo Stanton, is right behind him with 7/1 odds having switched leagues to join the New York Yankees from Miami. With the departure of Stanton from the National League, the void of favourite is currently being filled by the Chicago Cubs’ third baseman Kris Bryant (7/1). According to Betway, Bryant is followed closely by Bryce Harper (8/1), Nolan Arenado, Corey Seager (11/1) and Joey Votto (12/1). In the American League, Angels’ center fielder Mike Trout is a familiar favourite at 3/1 odds, while Houston’s Carlos Correa is closest behind Stanton and his teammate Altuve at 10/1 odds. 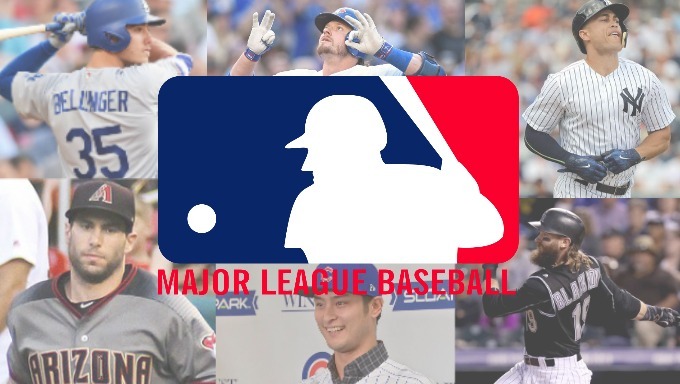 Some contenders to consider that might be a little off the beaten path and some candidates for breakout seasons in the American League when looking at 888sport include Josh Donaldson (20/1 odds), Andrew Benintendi (66/1) and Shohei Ohtani. Donaldson has already proven he is MVP-caliber having won the award back in 2015, but has struggled with maintaining that form due to injuries. He’s coming off an injury-shortened 113-game season in which he still batted .270, hit 33 homers and knocked in 78 RBI. He’s also about to be an unrestricted free agent in 2019, so, at 32, he’s got plenty of extra incentive to show his maximum value this season and prove he hasn’t passed his prime just yet. Benintendi’s chances are all about potential, something the 23-year-old still has plenty of. He’s one of the best bats and defenders on a loaded Red Sox roster and still has his prime ahead of him. That being said, he batted .271, crushed 20 home runs and drove in 90 RBI and many experts expect him to improve those numbers this season. That alone puts him in the conversation for MVP and his ceiling due to youth is limitless. Ohtani is an interesting consideration given the uniqueness he brings to the big leagues. While joining the team officially as a pitcher, Ohtani will also be a designated hitter as “the Japanese Babe Ruth” is one of the most promising two-way prospects MLB has seen in decades. The Angels’ experiment could blow up in their face or become the biggest story of the year, and if Ohtani can excel both on the mound and in the batter’s box, he’d definitely be able to work his way into the MVP discussion. In the National League Paul Goldschmidt of the Arizona Diamondbacks is the sixth guy in line for MVP based on his 12/1 odds with Ladbrokes, but he is more than capable of surpassing that projection by season’s end. The market he plays in may make him an afterthought most of the time, but his numbers are making him impossible to ignore. Goldschmidt’s been a perennial All Star since 2013 and matched his career high in homers with 36 last season while batting .297 for the second season in a row and knocking in 120 RBI. Those stats landed him in third place in the MVP race this season, but a repeat performance or improvement that’s still possible at age 30 could have him in serious contention again this season. Like his teammate, Corey Seager, Cody Bellinger exploded onto the national stage last season with one of the most exciting rookie campaigns in recent memory. The 22-year-old first baseman crushed 39 home runs, knocked in 97 RBI and batted .267 while finishing ninth in the MVP race and winning Rookie of the Year. At his age, he can only be projected to get better and it would be a safe bet that on his current pace he’ll be back in the MVP discussion this season and beyond. Moving on, Charlie Blackmon plays his home games in an incredibly hitter-friendly ballpark in Coors Field. That is literally the only strain of logic that could allow a player that posted his bonkers stats in 2017 to finish fifth in MVP voting. The 31-year-old Rockies centerfielder batted a jaw-dropping .324 in 2016 and actually topped that last season with an incredible .331 average. He hit 37 homers to go with that average, knocked in 104 RBI and led the league in hits (213), runs scored (137) and triples (14). Blackmon faces 28/1 odds to take home MVP this season and based on that resume is well worth the risk.